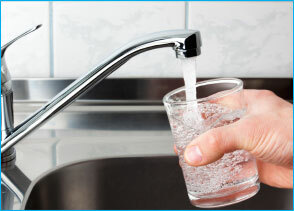 Many communities depend on some form of water purification. This month, our focus is on Reverse Osmosis (RO) plants, which provide numerous benefits but require a highly skilled crew to manage. Having an expertly-managed RO plant is critical for agricultural areas, where higher nitrate levels in the groundwater supply are often found. This is usually due to nitrate-rich fertilizer and manure application. Rain and irrigation waters can transport nitrates into rivers or streams and down through the soil into aquifers. At high enough levels, these nitrates can pose a serious public health hazard. And that’s where RO comes in. RO uses a pressure-driven membrane separation process to remove ions, salts, bacteria, and, you guessed it, nitrates. All the bad stuff remains on the pressurized side of the membrane while the pure solvent (i.e. water) is allowed to pass to the other side, giving you fresh drinking water. One of the benefits of using the RO process for water purification is that it does not require thermal energy. Instead, it is regulated by the use of high-pressure pumps. To maximize efficiency and keep costs low, you need trained professionals who understand the needs of the specific RO system they work with. The city of Riverside, Iowa, is a valued PeopleService partner, and that community’s state-of-the-art facility provides an excellent example of the complexities and value of an RO system staffed by certified experts. This RO facility continues to operate at peak efficiency and supply the city of Riverside with drinking water that’s free of nitrates and other harmful contaminants. Understanding the needs of each community, the systems in place and how these systems operate is what makes PeopleService so valuable to the communities we serve. The expertise we’ve developed over almost three decades of service has given us the ability to staff, operate and manage water and wastewater facilities of all types and sizes. We provide the expertise needed to run a basic lagoon water treatment system all the way up to the complex inner workings of a modern RO plant. If you have questions about RO or any treatment system, PeopleService is ready to provide the expert advice you need to ensure your system runs at peak performance and, if not, to get you there while keeping your citizens safe.